Beautifully engraved certificate from the North American Edison Company issued in 1925. This historic document was printed by the American Banknote Company and has an ornate border around it. This item is hand signed by the Company’s Vice President (Ferdinand Sherwood) and Assistant Treasurer and is over 76 years old. 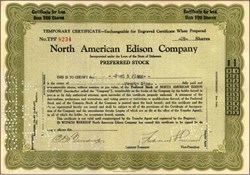 These were temporary certificates that were issued until the vignetted certificates were ready to be issued.